I was a little shocked the other day when talking to Miss A about the characters she would like to meet when we return to Disney World in a few weeks time. She has requested a meet with Anna and Elsa so this has been a high priority on our Fastpass+ list, however when I asked her if she would like to meet any of the other princesses, her answer was “no thanks, I met them last time”! Part of me was sad that she didn’t want to meet them again but then I realised this was actually a blessing as we would be able to fit in (hopefully) meeting a lot of the characters we didn’t get a chance to spot last tine. 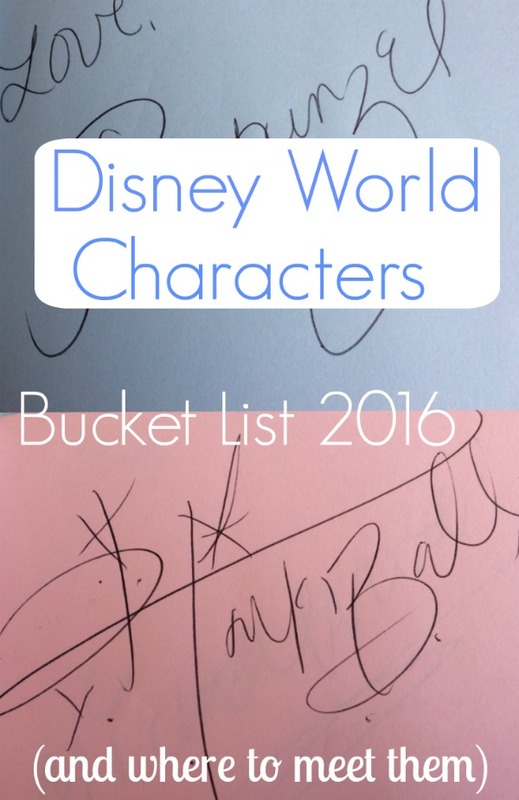 We have taken some time together and worked through the list of characters she would like to meet (and I may have put the odd one in there for myself), and come up with our characters bucket list for 2016. During our trip in 2014 we didn’t really know what to expect. Miss A’s only request was to meet Rapunzel on the last visit and I didn’t end up booking a Fastpass slot for her until a week into our stay for the second week (I think I got lucky with a cancellation). We took our chances and met some of the characters as we spotted lines for them, but I came home a little disappointed that I was never able to catch Minnie Mouse (I was looking in the wrong places), and I never managed to see an original Mickey Mouse (again I was looking in the wrong places). I now know where to go to meet these characters and wish I had done some research the first time around. Gaston (meets next to Gaston’s Tavern in Fantasyland). I know Miss A has been strengthening her muscles lately by using the bars at gymnastics so I know she wants to show Gaston her muscles. Minnie Mouse and Mickey Mouse (I have actually booked a Fastpass selection for the Epcot Character Spot where we will be able to meet original Minnie and Mickey. We also have a Fastpass selection for Animal Kingdom Character Outpost as this is the only place to have your photo taken with Minnie and Mickey together in their safari gear. There are plenty of places to meet Mickey and Minnie in different outfits, but my agenda is in their original outfits this time around. Alice (meets in Epcot in the UK Pavillion – we missed her last time as Mary Poppins was out as we passed and Alice wasn’t due for two hours, and in Magic Kingdom in Fantasyland). Ariel (meets in her grotto in Magic Kingdom in Fantasyland) – One princess Miss A has opted to meet this time. Eeyore (meets in Magic Kingdom in Fantasyland or at the Crystal Palace restaurant in Magic Kingdom). I will be hoping to catch him at the Winnie the Pooh Character spot in Fantasyland as we don’t have reservations for the Crystal Palace. Tremaine Family (meets in Magic Kingdom behind the castle. We still have quite an extensive list to try to complete when we’re there this year. A lot of our character choices appear to be in Magic Kingdom, so I know I will have to be checking the time slots for the character meet and greets as we get closer to try to tie them into our daily plans without it being too structured and stressful. I was glad we met Duffy Bear in 2014 as he has now been retired from meet and greets. 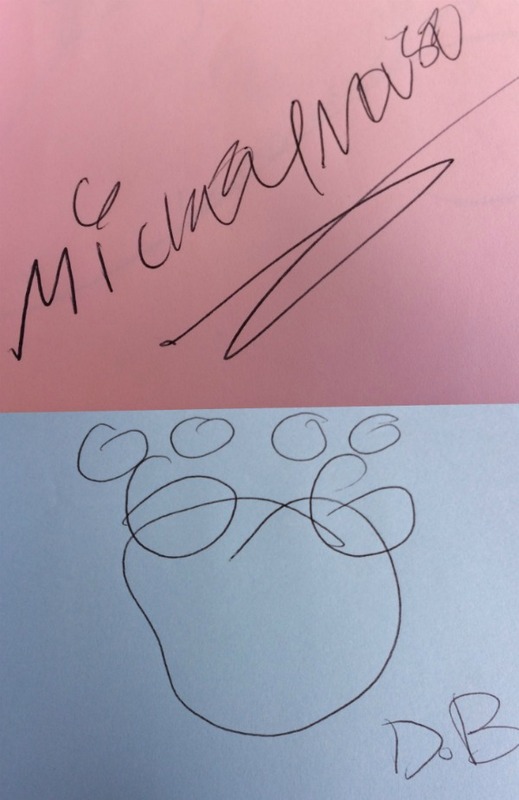 Miss A declined the choice to take her half full autograph book from 2014 and would like a new one for 2016. They are a little cheaper to buy on Amazon before we go rather than waiting until we get to the park, so I will be purchasing before I go like some of the other items that are cheaper to buy before you go to Disney World. Who would be on your Disney World Characters bucket list?